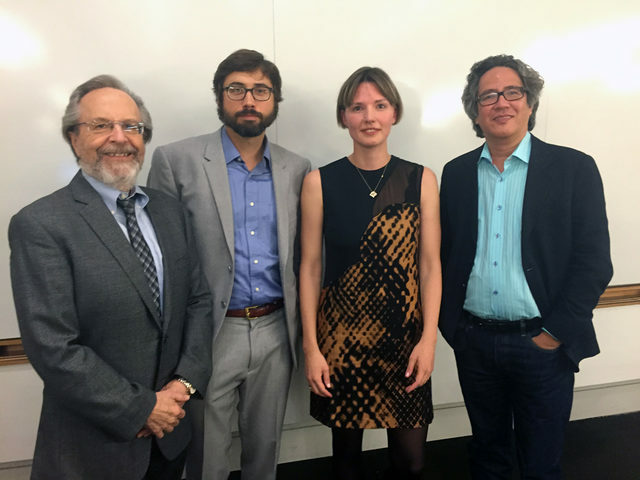 On June 4, Richard Bonneau of the Simons Center for Data Analysis (SCDA) and New York University (NYU) was presented with NYU’s prestigious Iakobachvili Faculty Science Award. Bonneau, along with experimental physicist Jasna Brujic, received this honor recognizing mid-career science faculty who have most clearly demonstrated evidence of past excellence and future prospects for growth. Brujic and Bonneau each presented short lectures on their work for those gathered. Bonneau leads SCDA’s systems biology group, and maintains a lab at NYU. From left, Dean Thomas Carew, Richard Bonneau, Jasna Brujic and Dean Michael Purugganan.